Island. Vacationing readers looking for a comparison to someone else’s vacation that provides humor and pleasure should consider reading Emma Straub’s novel The Vacationers. The Posts head to the island of Mallorca for a two week vacation bringing along their troubles and some secrets. After thirty five years of the ups and downs of marriage, Jim and Franny Post have reached a crisis point. Jim lost his job as a magazine editor after he had an inappropriate affair with a young colleague. Franny is furious. Daughter Sylvia heads to Brown soon, and her summer plan is to get laid. She knows something is bad in her parents’ relationship, but isn’t sure what it is. Twenty-eight year-old son Bobby lives in Florida with Carmen, a personal trainer. While his parents think he’s selling real estate, he’s in debt and working as a trainer and a peddler of nutritional powder. Bobby has no clue about his father’s indiscretion. Franny’s best friend, Charles, and his husband, Lawrence are also on this vacation while they await news about a potential adoption. On the island, all the secrets have no place to hide, and the two weeks provide just enough time for things to happen to all the characters. I enjoyed this novel because it provided the perfect light reading experience, with enough insight into human behavior to make the actions of every character ring true by the end. Rating: Five-star (I love it) Click here to purchase The Vacationers from amazon.com. Key. Genius and insanity can go hand in hand. Mai Jia’s novel, Decoded, presents readers with a fascinating protagonist, Rong Jinzhen, a genius at math. Once his talents are recognized, he’s taken from his family and placed in a special unit of cryptographers. Jia captures the psychological components of Jinzhen’s situation, and structures the novel to require readers to search for ways to figure out this interesting person and his predicament. Every code seems to require a key, and Jinzhen cracks most codes swiftly, almost effortlessly. There are dreams to reckon with and adversaries who may be friends, and friends who may be adversaries. I suggest reading an excerpt before leaping into this novel. Perhaps there were translation challenges, or cultural signposts I missed, but I found the odd structure more off putting than challenging. Rating: Three-star (It’s ok) Click here to purchase Decoded from amazon.com. Justice. The sixteenth novel by Charles Todd featuring Ian Rutledge of Scotland Yard is titled Hunting Shadows and is set in 1920. Rutledge is eager to get out of London, especially to avoid the impatient acting chief superintendent. Two murders within two weeks in the Fen country represent an unusual event, and the assistance of Scotland Yard is needed. Rutledge begins the case literally in the fog, when he loses his way in a heavy mist while trying to get to his first destination. The case proceeds at a moderate pace, and Rutledge scrambles to figure things out quickly to keep the superintendent happy and to bring the murderer to justice. Fans of the series will love this installment, and any reader who likes character based crime fiction will find something to like in this novel. Rating: Four-star (I like it) Click here to purchase Hunting Shadows from amazon.com. Betrayal. The first novel by Pieter Aspe to feature Belgian detective Pieter Van In is titled, The Square of Revenge. I started reading this series with the second installment translated into English titled, The Midas Murders, and I was hooked. Readers who enjoy character-driven crime fiction should consider reading this novel and the series. The action starts with an unusual burglary of a family owned jewelry store. Van In arrives on the scene and meets an attractive deputy prosecutor, Hannelore Martens. Their interplay provides a lot of the pleasure to readers of this book. Something strange is happening, and the well-connected paterfamilias wants the burglary investigation to die a quiet death. Instead, Van In and Hannelore pursue it, and when a kidnapping in the family increases attention, they focus all their efforts on bringing the case to a satisfactory conclusion. This is a story of family betrayal and the revenge that serves as a type of justice for what happened in the past. Rating: Four-star (I like it) Click here to purchase The Square of Revenge from amazon.com. Loyalty. Fans of Ian Rankin will be thrilled that he’s continued to develop the characters of both John Rebus and Malcolm Fox in his novel titled, Saints of the Shadow Bible. The interplay of by-the-book Fox with off-the-reservation Rebus provides a lot of pleasure in this novel, especially when it becomes clear that they are coming to understand and like each other. The action in the case involves the behavior of some former detectives with whom Rebus was associated as a rookie detective decades earlier. The loyalty he committed to the group in the book’s title comes under pressure when he investigates a murder from thirty years ago. Fans of crime fiction, especially this series, will find a lot to enjoy in this installment. Rating: Four-star (I like it) Click here to purchase Saints of the Shadow Bible from amazon.com. Disbelief. Readers who love thrillers will enjoy the action in Joseph Finder’s novel, Suspicion. Protagonist Danny Goodman struggles as a writer and a single father. The best part of life for his daughter, Abby, since her mother died of cancer, is her private school and her friendship with a new student at the school, Jenny Galvin. Goodman burned through his book advance and lacks funds for many things, but especially for Abby’s tuition and the cost of activities related to the school. Danny reluctantly accepts a loan from Jenny’s wealthy dad, Tom Galvin, who is thrilled that Jenny has found stability at the school because of her friendship with Abby. That simple setup leads to a wild ride in the thrilling plot, causing me to question often my suspension of disbelief, as Danny becomes involved with the high life of vacation via private plane to ski for the weekend, and the low life of violent drug cartels and intimidation by federal agents. For those readers who can set aside the frequent implausibility of the plotlines, the novel is both entertaining and exciting. I barely had time to pursue my disbelief by the time I finished the novel. Rating: Four-star (I like it) Click here to purchase Suspicion from amazon.com. Water. I can’t think of what Amy Greene could have done better in her novel, Long Man. Using fewer than three hundred pages, Greene transports readers to depression-era Tennessee. She adds tension to the plot as a TVA dam is flooding the town of Yuneetah, and some residents, including the strong protagonist, Annie Clyde Dodson, feel so bound to this land that they don’t want to leave. Annie Clyde’s three-year-old daughter, Gracie, goes missing. Heavy rain is causing the river to rise. Multiple characters with their own backstories add to the drama unfolding. Water itself comes to life in this novel as if it, too, were a character. Plot, setting and characters combine so well that it is easy for me to recommend this book. Greene’s lyrical prose put this novel over the top for me, and led me to give it the highest rating. Rating: Five-star (I love it) Click here to purchase Long Man from amazon.com. Retired. All the elements of good crime fiction are evident in Stephen King’s novel, Mr. Mercedes. The detective protagonist, Bill Hodges, is an interesting, complex and flawed character who loves his work. The criminal, known as the Mercedes killer for the way he used an automobile, engages in a well-matched contest of wits and skills with Hodges. The plot develops at a pace that keeps a reader engaged, and the dialogue suits each character. Hodges finds little reason to live now that he has retired from a long career as a detective. He finds new energy and meaning when the Mercedes killer taunts him about his failure to solve this case. King excels at storytelling, and he finds ways to develop each character so that we recognize them as fully formed humans behaving with all the irrationality and unpredictability that we live with daily. I was entertained by this novel and recommend it to any reader who likes crime fiction with well-developed characters and an engaging plot. Rating: Four-star (I like it) Click here to purchase Mr Mercedes from amazon.com. Voices. Paris provides a great backdrop for a novel set during any time period, and the 1930s gave Francine Prose plenty of atmosphere for her novel titled, Lovers at the Chameleon Club. Readers who enjoy literary fiction will find the writing here to bring delight, although I found it challenging to stay alert as Prose shifts narrators often and uses multiple perspectives to present this story. As most readers would expect, the truth lies somewhere among these different views. The variety in the novel will find things many readers will love or hate: cross-dressing, athletics, Olympics, Nazi espionage, photography, nightlife. I found it slow to get into the novel, but once I became accustomed to the structure, I zipped to the end, enjoying the fine writing and engaging story. Rating: Four-star (I like it) Click here to purchase Lovers at the Chameleon Club from amazon.com. Thugs. The latest crime novel by Peter Mayle to feature protagonist Sam Levitt is titled, The Corsican Caper. A wealthy Russian thug, Oleg Vronsky, covets the beautiful home of Sam’s billionaire friend Francis Reboul, and offers a premium price to have it for himself. When Reboul refuses, Vronsky becomes enraged, and the action commences. The bad guys are thugs, the good guys are clever, and the case wraps up almost as soon as it starts. Most readers can finish the novel in a single sitting. Rating: Four-star (I like it) Click here to purchase The Corsican Caper from amazon.com. Malaprop. The third novel in the series by Colin Cotterill to feature Jimm Juree is titled, The Axe Factor. Readers who enjoy light fiction are those most likely to enjoy this novel and this series. Jimm and her quirky family have left Chiang Mai for a small village in Southern Thailand. 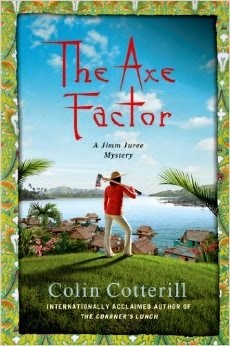 She gets an assignment to interview a local crime writer who is splitting watermelon with an axe when she meets him. The serious subject in one part of the novel calls attention to how poor mothers rely on formula instead of breastfeeding and how that leads to some bad outcomes. I found the great wit in the novel came from the headings for many chapters with signs that have been translated with the fine art of malapropism. Rating: Three-star (It’s ok) Click here to purchase The Axe Factor from amazon.com. Choices. I’ve looked forward to reading former Treasury Secretary Timothy Geithner’s reflections on the financial crisis. His addition to the views already presented in other books by participants including Hank Paulson and Sheila Bair adds to the perspective that interested readers can gain from hearing from different players. Geithner outlines all the hard choices he and the other key players at the time had to make when facing multiple bad alternatives. Since Hilary Clinton selected “hard choices” as the title for her latest memoir, Geithner settled for Stress Test, a reference to one of the key decisions he made to evaluate the capital position of banks. The writing is straightforward, and he deflects critics often by calling attention to the paucity of alternatives that were proposed. Geithner felt strongly throughout his tenure in government service that he was trying to do the right thing; he was aware that his actions were often misunderstood; and he acknowledges that his communication skills are poor. Thanks to a good ghost writer, he communicates clearly in this book, and whether you agree or disagree with what he did, especially as Treasury Secretary, you’re likely to come away from the book concluding that he presents a cogent case for the hard choices he made. Rating: Five-star (I love it) Click here to purchase Stress Test from amazon.com. Questions. Readers who like novels that explore deep questions and who are open to a quirky and unusual structure are those most likely to enjoy reading Jesse Ball’s novel, Silence Once Begun. Why would an innocent man not speak up for himself? What is justice? Thirty years after an innocent man kept silence while imprisoned, a journalist named Jesse Ball questions many people about what happened. Readers are left wondering which accounts are closer to the truth. Photographs appear at different points in the text, speaking in a way to the reader, like the silence that also speaks powerfully. I enjoyed the creativity of this novel and was able to appreciate the unusual way in which Ball wrote it. Rating: Four-star (I like it) Click here to purchase Silence Once Begun from amazon.com. Enough. It didn’t take me long to read the latest book from Steven Levitt and Stephen Dubner titled, Think Like a Freak: The Authors of Freakonomics Offer to Retrain Your Brain. I liked the earlier Freakonomics books, and expected to enjoy this one. Instead, I realized I’ve read enough. While the new book provides new examples and a framework to adjust one’s thinking, I felt as if I’d read it all before. Rating: Three-star (It’s ok) Click here to purchase Think Like a Freak from amazon.com. Looming. Darkness and evil seem to loom over every page of Allan Furst’s latest novel titled, Midnight in Europe. Set mostly in Paris in the late 1930s, the novel features Cristian Ferrar, a Spaniard who works as a lawyer in Paris. What Furst has done in earlier novels also works in this one: he takes ordinary people and places them in situations that draw out the best of human nature. Ferrar helps deliver arms to the Spanish Republicans in their fight against Franco and the Nationalists. There’s excitement, wit, skill and danger all at play in this novel. I enjoy reading Furst for the way he brings the setting of the period to life. I would say he makes it vivid, but in this case, he illuminates the darkness of that time for contemporary readers. Rating: Four-star (I like it) Click here to purchase Midnight in Europe from amazon.com. Balance. Euphoria is close to the feeling I had after completing Lily King’s finely written novel by that title. I can’t think of an element that King didn’t get just right in this novel. Three main characters are introduced and developed with skill and their behavior at work and in relationship will resonate for most readers. The setting of these anthropologists living among the tribes in New Guinea comes alive through King’s lyrical prose. The plot moved quickly, and exposition was restrained to what was essential to create an integrated novel. King maintains all elements in a perfect balance. Readers who enjoy literary fiction will find much to like in this novel. Rating: Five-star (I love it) Click here to purchase Euphoria from amazon.com. Deprecating. The satire I’ve enjoyed in reading Gary Shteyngart’s novels has turned to self-deprecation in his memoir, Little Failure. I found that after reading a chapter, I didn’t want to read the next one. In small doses, Shteyngart’s wit comes across as clever and entertaining. I learned that too much of a good thing can become boring. What kept me reading and what pushed me past boredom is Shteyngart’s fine writing. He crafts great sentences that kept me turning the pages. Rating: Three-star (It’s ok) Click here to purchase Little Failure from amazon.com. Prague. Jacob Putnam, the protagonist of Caleb Crain’s debut novel, Necessary Errors, arrives in Prague in 1990. Jacob is on the brink of adulthood, and the city is ready for transformation from communism to capitalism. Crain lets readers slowly enter into the everyday nature of what life is like for Jacob at that time and in that place. While at times I became bored by the minutiae of the exposition, I always came back to the sense that I was seeing the situation unfold as would any newcomer to an unfamiliar setting. Over the course of the novel, both Jacob and the city both seem to be getting more of what they want. Readers who enjoy literary fiction and who can tolerate a lot of reading about “nothing” are those most likely to enjoy this finely written novel. Rating: Four-star (I like it) Click here to purchase Necessary Errors from amazon.com. Documents. I opened Susan Rieger’s debut novel, The Divorce Papers, expecting to find it tedious. Instead of a traditional narrator, Rieger uses paperwork, a variety of different documents including email, court filings and letters, to tell the story. I anticipated that this structure would fall apart after a few dozen documents. I was pleasantly surprised that the structured delighted me, and added to the pleasure of the story. Rieger presents a cast of characters who are fully human: some likeable and some not. Protagonist Sophie Diehl is a 29-year-old criminal defense attorney for a small firm in a New England state. She reluctantly agrees to the request of the managing partner that she handle the divorce of the daughter of the CEO of one of the firm’s biggest clients. All of the characters become fleshed out through their email and notes, and I was impressed with how well Rieger pulled that off. Readers looking for something innovative in fiction and willing to look at a debut novel should consider reading this one. Rating: Four-star (I like it) Click here to purchase The Divorce Papers from amazon.com. Identity. The protagonist of Joshua Ferris’ novel, To Rise Again at a Decent Hour, is not your average dentist. Paul O’Rourke runs a lucrative Park Avenue dental practice with a quirky staff that includes his former lover. He’s a Red Sox fan in Yankee country. His identity is stolen and religious proclamations start appearing on a website O’Rourke did not create, causing consternation to his atheistic sensibilities. This novel is quirky, clever, witty and thoroughly entertaining, especially to those readers who can be patient and who appreciate the ways in which Ferris draws out beliefs and behavior that reveal character and true identity. Rating: Four-star (I like it) Click here to purchase To Rise Again at a Decent Hour from amazon.com. Secession. The latest novel by Steve Berry to feature Cotton Malone is titled, The Lincoln Myth. The popular and successful formula from the earlier Malone novels returns: the retired Justice Department agent and current antiquarian bookseller is called back to government work. Berry blends fact and fiction throughout the novel, and adds an appendix to the novel with an explication of the difference. There’s a contemporary plotline and a historical plotline that merge to deliver hours of satisfying reading to those who like this formula. Rating: Four-star (I like it) Click here to purchase The Lincoln Myth from amazon.com. Passion. There are eleven short stories in the collection by Carolyn Cooke titled for one of them, Amor and Psycho. I spread my reading of this collection out, selecting one story about every two weeks. I enjoyed Cooke’s wit and the way she can twist a phrase to pack as much passion as possible into a few of just the right words. Life and death are side by side in these stories, and passion and physical decline coexist. Readers who like literary fiction and the short story genre are those most likely to enjoy this collection. Rating: Three-star (It’s ok) Click here to purchase Amor and Psycho from amazon.com. Lessons. Longtime high school English teacher David McCullough, Jr. was surprised when his commencement address became a social media sensation. The theme of the address touched a popular nerve: You Are Not Special. The buzz led to a book deal, and while the commencement address itself appears at the end of the book, the bulk of the text does what McCullough does best: it teaches. The lessons McCullough presents, as we should expect, come from literature. I enjoyed reading the solid life lessons in this book, and recommend the book to any reader who likes to think for him or herself. Rating: Four-star (I like it) Click here to purchase You Are Not Special from amazon.com. Succinct. Some writers tend to show off their skill by packing a work of fiction with lots of exposition. Not so with Karen Joy Fowler in her small book, The Science of Herself. Fowler writes succinctly, in finely crafted prose, presenting just enough exposition to satisfy most readers. In most of this short book, she tells readers of a Darwin contemporary, Mary Anning, a fossil collector whose intelligence and experience fought the male scientific establishment. I read this book in two short bursts, and came away with the pleasurable feeling that the balance of presenting just the right amount of prose hit the target perfectly. Rating: Four-star (I like it) Click here to purchase The Science of Herself from amazon.com. Maturity. Popular serial author Alexander McCall Smith takes a fresh approach in his stand alone novel titled, The Forever Girl. Instead of gradually revealing the lives of a cast of characters in a specific locale, Smith dives deeper into a few characters and places them in different settings around the world. The theme of the novel involves mature love: expressed, conflicted, and unrequited. There’s a weightiness and darkness that permeates this novel, another element quite unlike the rest of Smith’s fiction. I enjoyed reading this novel, and observing the ways in which the characters mature as they gain experience and rethink prior ideas. Rating: Four-star (I like it) Click here to purchase The Forever Girl from amazon.com.